This article is about the Italian national broadcasting company. For other uses, see Rai (disambiguation). RAI — Radiotelevisione italiana S.p.A.
RAI broadcasts are also received in neighbouring countries, including Albania, Bosnia, Croatia, Malta, Monaco, Montenegro, San Marino, Slovenia, Vatican City, Switzerland, and Tunisia, and elsewhere on pay television. Half of the RAI's revenues come from broadcast receiving licence fees, the rest from the sale of advertising time. In 1950, the RAI became one of the 23 founding broadcasting organizations of the European Broadcasting Union. The Unione Radiofonica Italiana (URI) was formed in 1924 with the backing of the Marconi Company following a model adopted in other European countries. URI made its inaugural broadcast — a speech by Benito Mussolini at Teatro Costanzi — on 5 October. Regular programming began the following evening, with a quartet performing Haydn's Quartet No. 7 in A major from the Palazzo Corradi. At 21.00 CET, Ines Donarelli Viviani announced for the first time: "URI—Unione Radiofonica Italiana Rome station 1RO 425 meters wavelength. To all those who are listening our greetings, good evening." Guglielmo Marconi's S.A. Radiofono—Società Italiana per le Radiocomunicazioni Circolari (Radiofono) held 85% of URI shares and Western Electric's Società Italiana Radio Audizioni Circolari (SIRAC) held the remaining 15%. Under the provisions of Royal Decree No. 1067 of 8 February 1923, wireless broadcasting became a state monopoly under the control of the Ministry of Posts and Telegraphs; URI was commissioned to provide services for a minimum of six years pursuant to Royal Decree No. 2191 of 14 October 1924 "Concessione dei servizi radioauditivi circolari alla Società Anonima Unione Radiofonica Italiana". However, when URI's contract expired in 1927, it was succeeded under Royal Decree Law No. 2207 of 17 November 1927 by the partially nationalised Ente Italiano per le Audizioni Radiofoniche (EIAR), which became Radio Audizioni Italiane S.p.A. (RAI) with investment from Società Idroelettrica Piemontese (SIP) in 1944. During the reconstruction following World War II, much of RAI's early programming was influenced by the "Reithian" style of the BBC. The emphasis was on educational content. Programs like Non è mai troppo tardi and Un viaggio al Po introduced people to what life was like in other parts of the country, at a time when most people couldn't afford to travel. Over the following years the RAI made various changes to its services. It reorganized its radio stations in November 1946 into two national networks, Rete Rossa and Rete Azzurra ("Red Network" and "Blue Network"). It added the culture-based Terzo Programma in October 1950. On 1 January 1952 the Rete Rossa became the Programma Nazionale (focusing on informational content) and the Rete Azzurra became the Secondo Programma (with a greater emphasis on entertainment). The three radio channels eventually became today's Rai Radio 1, Rai Radio 2, and Rai Radio 3. In 1954 the state-owned holding company Istituto per la Ricostruzione Industriale (IRI) became the sole shareholder and IRI – now renamed RAI—Radiotelevisione italiana to reflect its extended responsibilities – finally began a regular television service. On 3 January at 11.00 CET, the first RAI television announcer presented the day's schedule, which was broadcast from the service's Milan headquarters and relay stations in Turin and Rome. At 14.30, the first regular programme in Italian television history was broadcast: Arrivi e partenze, hosted by Armando Pizzo and Mike Bongiorno. The evening's entertainment was a theatre performance, L'osteria della posta, written by Carlo Goldoni. 23.15 saw the start of the day's concluding programme, La Domenica Sportiva – the first edition of a weekly series which continues to this day. RAI was originally the subsidiary of RAI Holding S.p.A. RAI Holding was absorbed into RAI as of 1 December 2004, per Article 21 of Law 112/04. The RAI is governed by a nine-member Administrative Council. Seven of members are elected by a committee of the Italian Parliament. The other two (one of which is the President) are nominated by the largest shareholder: the Ministry of Economic Development. The Council appoints the Director-General. The Director-General and the members of the Administrative Council are appointed for a renewable three-year term. In 2005, the government of Silvio Berlusconi proposed partial privatization of RAI by selling 20% ownership. This proposal was very controversial, in part because Berlusconi was the head of the leading private broadcaster Mediaset. Some critics claimed that Mediaset could become the buyer and thus increase its dominant position. However, after the revelation that RAI would lose €80m ($96m, £54m) in 2006, the privatization plan was suspended in October 2005. On 18 May 2010, Raisat received a major upgrade and re-branded with a new logo and a new name. It and all of the sister channels dropped the sat part from the name and became Rai YoYo, Rai 5 (formerly known as Rai Extra), Rai Premium, and Rai Movie (formerly known as Raisat Cinema). On 11 June 2013, the RAI was one of the few known European broadcasters to condemn and criticize the closure of Greece's state broadcaster ERT. RAI company has been criticized because as of 2015 it had 46 directors and 262 head offices and they are considered too many; RAI Spa is a private company but it's 100% owned by the Italian Government and all the TV owners in Italy have to pay an annual tax of 100 euros. RAI Spa company is 99% owned by the Italian Government Ministry of Economy and Finance, so it is said that it broadcasts content that may politically influence people. Rai's first, original and older logo used from 3 January 1954 to 2 October 1983. Rai's third and former logo used from 1982 to 30 September 2000. First phase of Rai's third and former logo used until 1988. Rai's fourth and previous logo used from 1 October 2000 to 17 May 2010. Rai's fifth and current logo since 18 May 2010. First phase of Rai's fifth and current logo used until 11 September 2016. 1949; 70 years ago (1949) in Turin, Italy. Rai Libri is the print publishing arm of Rai, headquartered in Turin. They primarily publish magazines and periodicals for news, entertainment, the broadcast industry, and since their beginning, broadcast schedules. They also have published since 1969 the Dictionary of Orthography and Pronunciation [Wikidata], the largest Italian dictionary of its kind. 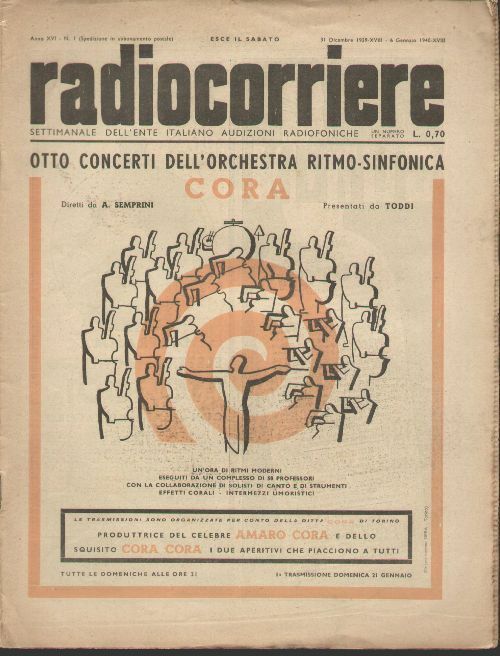 RAI's history in print with the Unione Radiofonica Italiana (URI)'s weekly magazine Radio Orario which debuted in January 1925 and became Radiocorriere in 1930. Edizioni Radio Italiana (ERI) was founded in 1949 in Turin, formed entirely from RAI capital to build on Radiocorriere's success. In 1954 primary ownership was split between RAI and Istituto per la Ricostruzione Industriale (IRI). That same year Radiocorriere became Radiocorriere TV, which would continue to be published until RAI divested in 1995. During the 50s and 60s the ERI published Classe Unica, L'Approdo letterario [it] and L'Approdo Musicale [it], and in 1969 the first edition of the DOP. The 80s saw the premiere of the monthlies Moda (1983) and King (1987), along with registering a new company name in 1987: Nuova Eri Edizioni Rai-Radiotelevisione Italiana S.p.A., or "Nuova ERI". Since the 90s RAI/ERI has increasingly focused on publishing books written by its own broadcast stars, both in news and entertainment. In 1995 Nuova ERI closed and reopened in 1996 as "Rai Eri". On 15 October 2018 they renamed to "Rai Libri". Rai Libri also edits technical publications: Elettronica e telecomunicazioni since 1946, Nuova rivista musicale italiana since 1967, and Nuova civiltà delle macchine since 1957. It produces its own reports on communications and media, with the second edition of the book-and-documentary RicordeRai released in 2004 in collaboration with Rai Teche. RAI (originally URI) had printed its broadcast schedules nearly without interruption starting in 1925 as Radio Orario, then from 1930 as Radiocorriere, then continuously from 1954 as Radiocorriere TV, until RAI divested in 1995. The magazine was restarted under publisher Rcc edizioni [it] with a print edition from 1999–2008, closing due to poor sales. It reopened in 2012 as an online-only publication, with a handful of special-occasion independent print runs in the intervening years, including 2005 (its 80th anniversary), 2010 (switchover to DTTV), and 2011 (150th anniversary of the unification of Italy). The "Rai Ufficio Stampa [press office]" website has meanwhile published programming schedules and television blurbs online since 2011 under the magazine's name. On 3 January 2014 Rai Teche published online the complete 1925–1995 archives of URI/RAI's Radio Orario/Radiocorriere/TV. There are RAI offices in foreign countries, which produce news reports that are broadcast live in Italy. These offices are in: Brussels, Paris, Berlin, London, New York City, Beijing, Cairo, Jerusalem, Nairobi, Moscow, Rio de Janeiro. As March 2015, the RAI has a debt of €442 million and the Italian Court of Audit was worried about the size of RAI's debt for the impact that this may have on Italian people, as the company is owned by the state. Italians must purchase an annual television license for about €100 every year in order to legally own a TV or HDTV. It is known as Canone Rai, "Rai Tax" because it is used to part-fund the RAI. ^ "Rai.it - Il gruppo Rai". www.rai.it. Retrieved 2017-12-25. ^ "Ascolti tv 2013 - Predominio Rai con Rai1 - DavideMaggio.it". DavideMaggio.it. Retrieved 5 July 2015. ^ ""RAI's privatisation is de facto suspended", its new director general, Alfredo Meocci, told a parliamentary watchdog committee". Archived from the original on 2006-05-14. Retrieved 2006-03-28. ^ "Berlusconi halts plan to sell off state broadcaster". Financial Times. Retrieved 5 July 2015. ^ "Il pubblico in fuga da una Rai faziosa". Retrieved 5 July 2015. ^ ""Rai faziosa" Brunetta lancia l'osservatorio online". Retrieved 5 July 2015. ^ "Rai Eri, la Rai da Leggere". Archived from the original on 2016-04-09. Retrieved 2016-02-17 – via www.eri.rai.it. ^ Websushi.it, ed. (2009-07-30). "Moda e King, l'ironia patinata". Archived from the original on 2016-07-30. Retrieved 2016-02-17 – via Retrovisore– un sito di Luca Pollini. ^ "ERI". Enciclopedia Treccani. Retrieved 2018-10-23. ^ Rivista tecnica dal 1946, cfr. il sito. ^ Su progetto di Leonardo Sinisgalli che ne diresse la prima serie (1957-1979) è oggi diretta dal comitato scientifico di Dario Antiseri, Edoardo Boncinelli, Umberto Bottazzini, Vittorio Marchis e Silvano Tagliagambe in collaborazione con il Centro D.I.E.A. (Documentazione su Ingegneria ed Etica Ambientale) della Facoltà di Ingegneria dell'Università di Bologna. 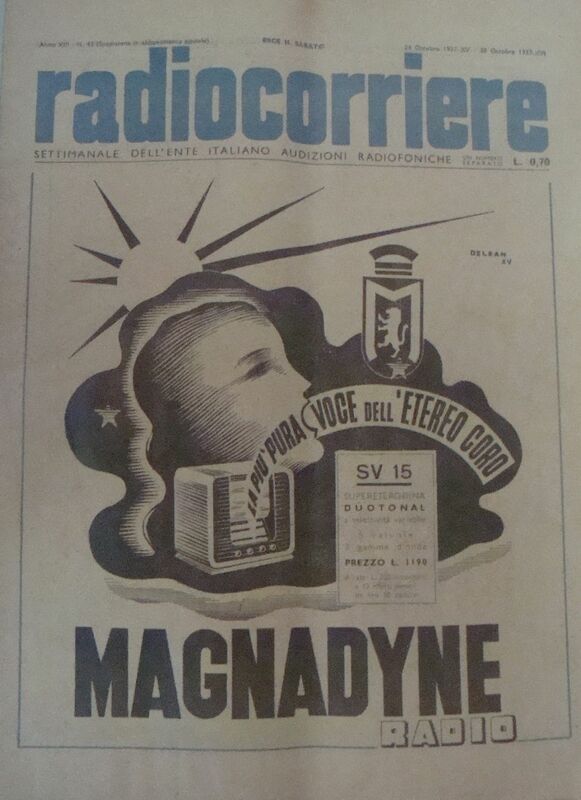 ^ Images of Radiocorriere from the 1930s: "Copertina del Radiocorriere del 24 ottobre 1937" (JPEG). Retrieved 2018-10-23. , "Copertina del Radiocorriere del 31 dicembre 1939" (JPEG). Retrieved 2018-10-23. , Altre prime pagine dal 1936 al 1977. ^ "Settant'anni di storia della radio e della tv italiane nelle pagine del Radiocorriere". Spettacoli - La Repubblica (in Italian). 2014-01-08. Retrieved 2018-02-24. ^ "Corte dei Conti, alert sul debito della Rai". Repubblica.it. 13 March 2015. Retrieved 5 July 2015.